Tuberculosis of the lung. 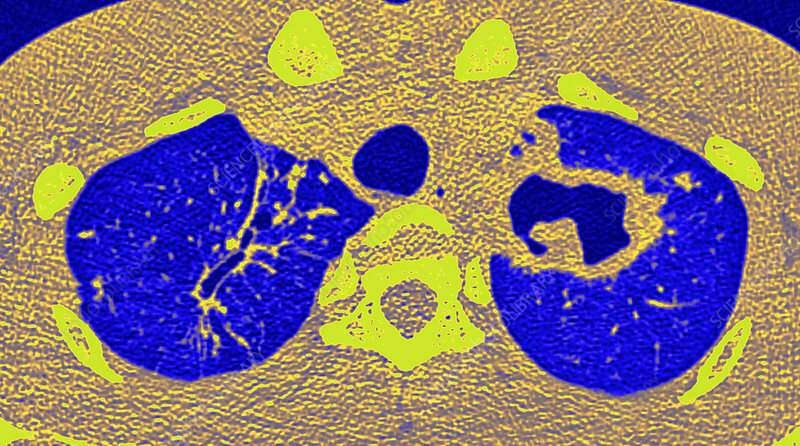 Coloured computed tomography (CT) scan of an axial section through the chest of a 30-year-old male patient, showing a large cavity and thickened wall in the left lung (right) caused by pulmonary tuberculosis (TB). Pulmonary TB is caused by infection with Mycobacterium tuberculosis bacteria. TB usually affects the lungs but can also affect other areas of the body, including lymph nodes, bones and joints, the digestive system, the bladder and reproductive system, and the nervous system.